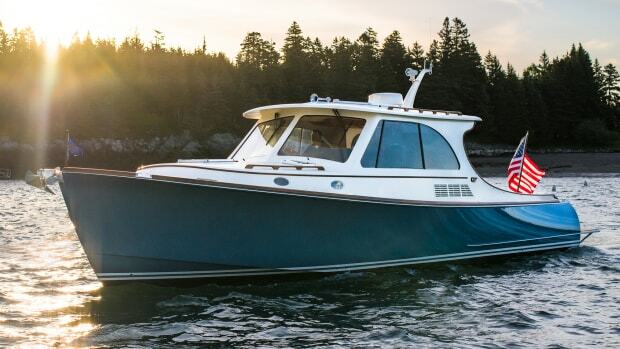 Is the Hinckley Dasher the Boat of Tomorrow? Traditional cleat on teak trim? That’s what they want you to think. 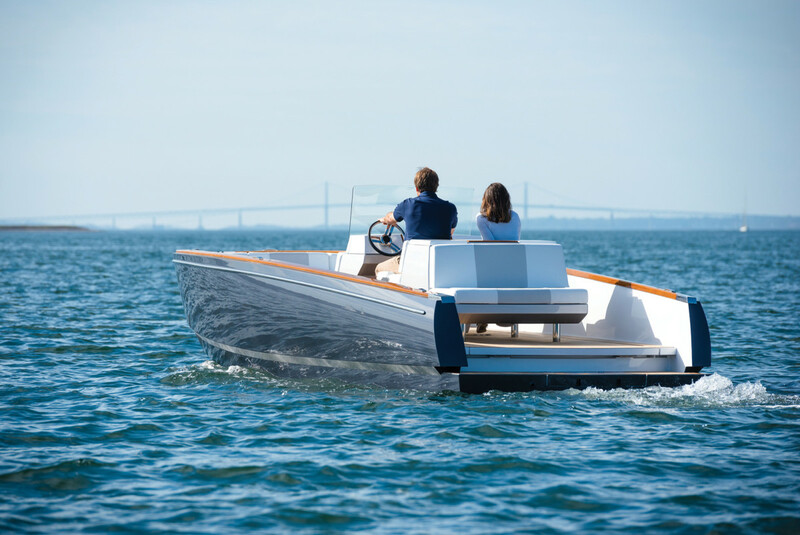 From artisan-painted plastic to 3D printed hardware, there is more to Hinckley’s new, FULLY ELECTRIC day boat than meets the eye. To see the future, we were told to walk across a concrete spindle bridge at the Hinckley boatyard in Stuart, Florida, past sailboats on blocks dripping from a recent powerwash in the midday sun. There, adjacent to the sales office, in an unassuming slip between two Hinckley Picnic Boats, was the future resting bow-in. If I didn’t know what I was looking for, I could have easily missed it while ogling one of the larger yachts nearby. That is, until my eyes adjusted and I looked at it anew. 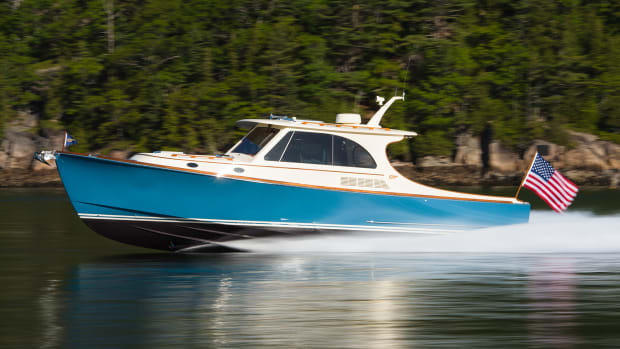 I had grown accustomed to seeing Dasher amid all the pomp and circumstance befitting a fully electric-powered yacht during this most recent boat-show circuit. She had either been hidden by coverings before a dramatic unveiling, tilted sideways on a custom-built lift or, more recently, in the water as the crown jewel of the Hinckley fleet. Now, resting in the Stuart boatyard slip, she looked angular, modest, and small. Like spotting a celebrity without makeup on at the supermarket. Which isn’t to say that Dasher doesn’t have a presence. 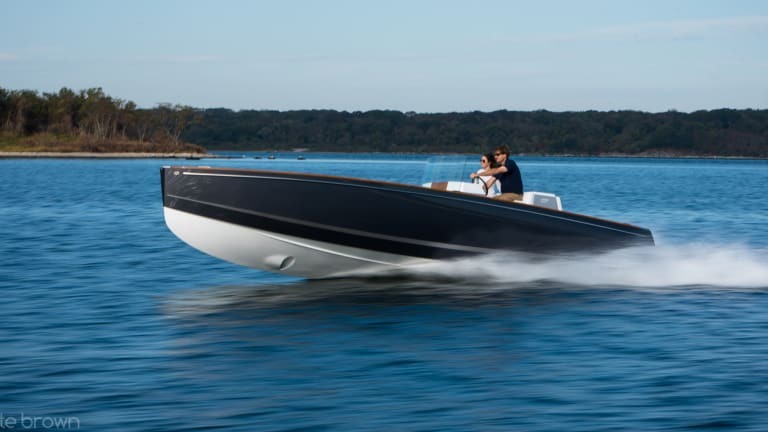 She’s a handsome boat with sleek, modern lines that hint at a number of technological innovations. 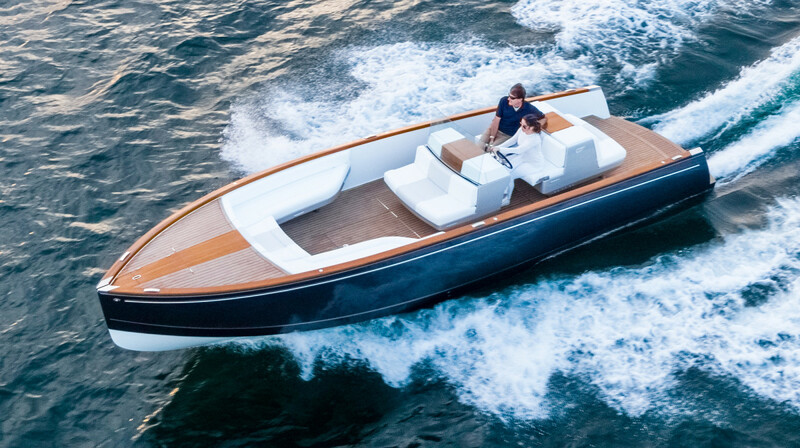 They include dual BMW i3 lithium-ion batteries and 3D printed titanium hardware, all seamlessly blended together in a 28-foot 6-inch carbon-epoxy composite hull with carbon stringers. Stark, sure, but minimalist by design. What I was in the process of seeing (or unseeing), I suddenly realized, was a product going from concept to reality before my very eyes. Until Scott Bryant, director of new product planning at Hinckley, turned on the motors. He looked at me with a Machiavellian grin. “Is it on?” I asked incredulously. “It’s on,” he said, still smiling conspiratorially. It made you focus harder. I could hear the distinct timbre of drills buzzing, hammer echoes coming from some far-flung corner of the yard. In that wholly unnatural silence for a powerboat, we undid the lines. 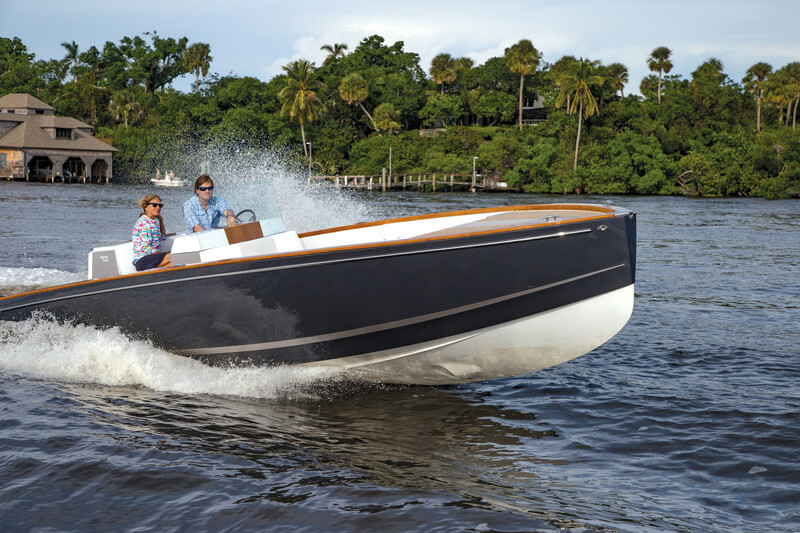 Bryant expertly maneuvered Dasher by joystick around Hinckleys of the past and present and into the St. Lucie River. Although, in that instant, from where I was standing on her noiseless deck, it was hard to shake the feeling that everything—all the boats around us—had suddenly taken on the qualities of a distant past. 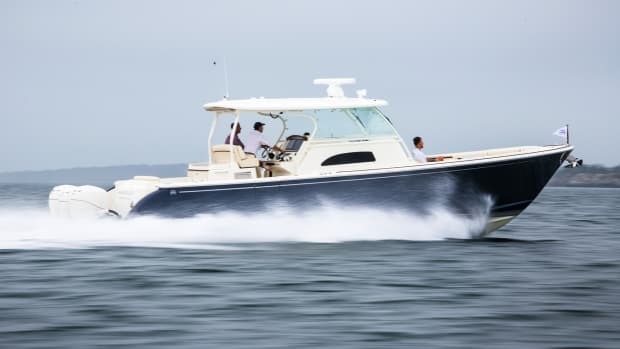 Almost two years ago to the day, Hinckley had gathered the greatest minds of their prospective fields at their corporate headquarters in Maine to determine what the future of boating looked like. Designer Michael Peters was there, as were naval architects, America’s Cup engineers steeped in aerospace experience, and even consultants from the automobile industry. I had chatted with Saladino before arriving in Stuart, at the Ft. Lauderdale International Boat Show. Saladino is graying around the temples but retains a boyish smile. He’s inquisitive, high energy, and upbeat—traits that most certainly served him well in his previous life, spending 13 years in the marketing department of Samsung Galaxy in the United States and Asia. That same exponential curve that makes you toss your phone for the latest and greatest each year has also affected the quality and price of BMW’s i3 lithium-ion batteries, which are marinized by the German electric-propulsion company Torqeedo and then placed aft under the helm of Dasher. 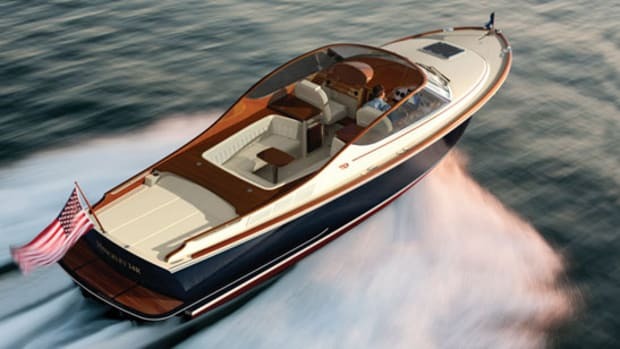 Suddenly, in 2018, a stylish, fully electric yacht seemingly makes sense. “Part of what’s happening is that the curve is growing at a rate where starting two years ago allowed us to bring Dasher to market at a time when it seems more obvious,” added Saladino. Throttling up on the St. Lucie River, it certainly did. 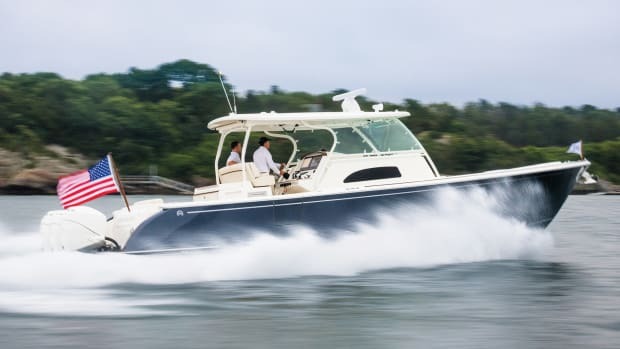 As we were leaving the Stuart yard, picking out a nice piece of watery real estate to test Dasher, a center console rigged for fighting sailfish tried to throw its weight around. “I’m going to get us out of this slop,” said Bryant, who was sitting at the helm. Lounging nearby were Creative Director Erin Kenney, Editor-in-Chief Dan Harding, and myself. 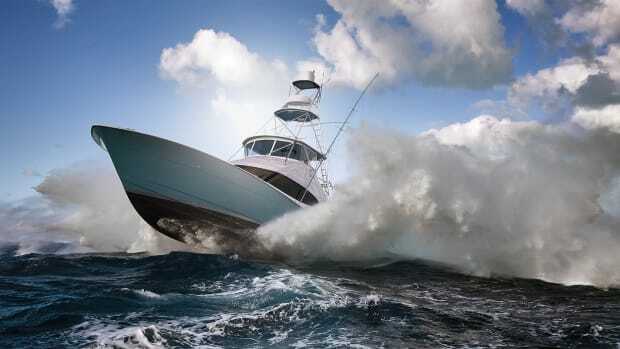 Bryant punched it, and suddenly we were comfortably planing at about 17 knots, the wind playfully tousling our hair, the other boat’s wake already forgotten. I had tested a Torqeedo electric outboard before, which would let out a sacrificial lamb’s squeal whenever you throttled above a single knot. 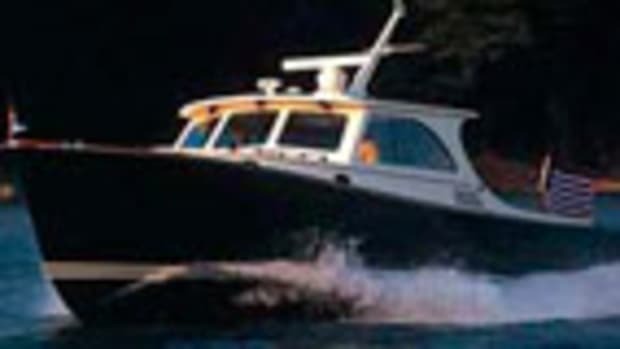 The loudest sound Dasher’s twin 80-horsepower Torqeedo inboards made was blowing bubbles. It was thrilling: unbridled, silent speed. How would they manage to work around—God forbid—having zero buttons? 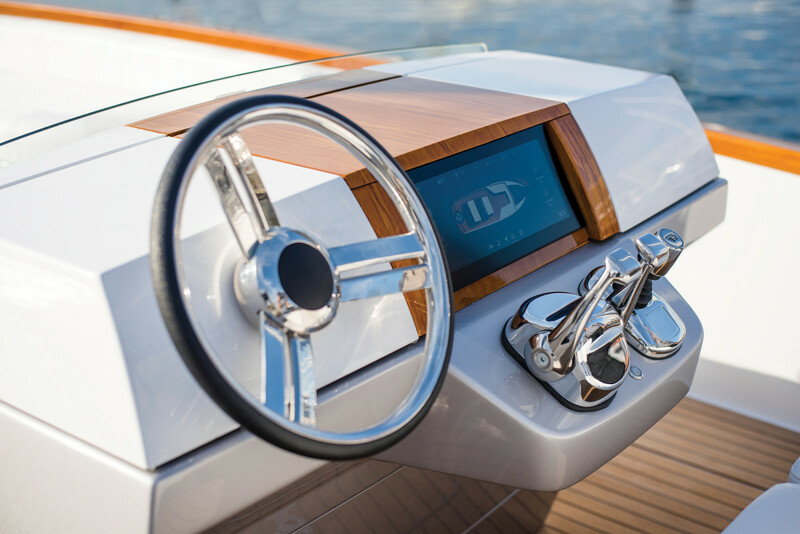 All of which is a conscious effort in the design of Dasher: This innovative technology—3D printing, electric propulsion, a single touchscreen that controls everything—was developed so that people can disconnect and spend more time with family and friends out on the water. “Keeping it simple allows the platform to disappear into the experience,” said Bryant. It was true. I hammered the throttle forward and we shot up around the boat’s max speed: 22 knots. To locate the range, a radius appeared in the form of a circle on the display from B&G, which would increase or decrease based on how much throttle you gave it. Corresponding symbols kept track of different things: an anchor for depth, a battery for the charge, a bucket for water levels (Dasher comes with a head forward). 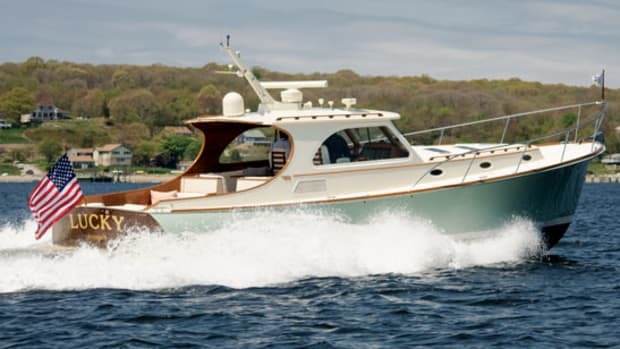 And by accepting dual 50-amp power—that you have to snake in along the deck and underneath the helm seating (a slight inconvenience that Hinckley says they are working on improving)—Dasher can gain a full charge in four hours. All you had to do, really, was check the weather and maybe bring some sunscreen. The boat seemed to handle the rest. 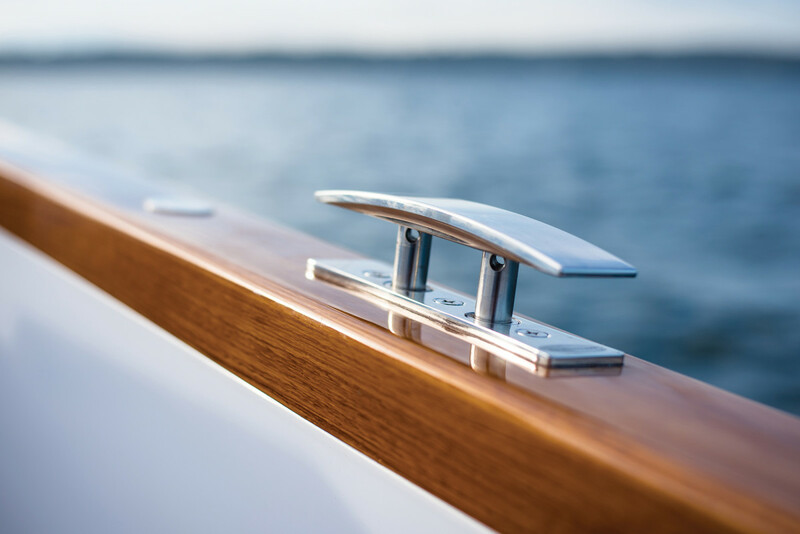 When Hinckley launched the original Dasher in 1994, it was a 36-foot picnic boat that made use of jet drives and an innovative piece of technology called the JetStick—or the precursor of today’s joysticks that are now nearly ubiquitous. The original Dasher helped grow Hinckley into the company it is today. Using the same name only made sense. Still, it was hard to shake the lingering feeling that the company was taking an immense gamble. 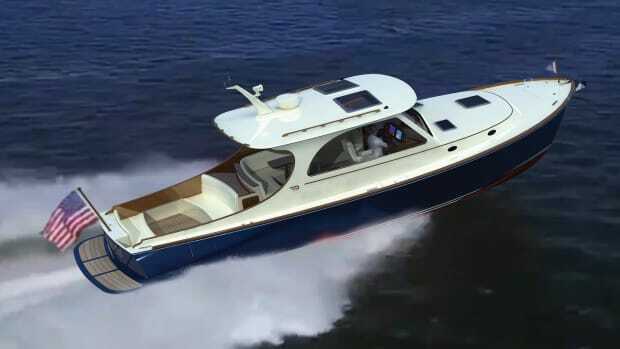 By pouring millions of dollars into R&D, utilizing 3D printing for the titanium hardware, and being out front with electric propulsion, it seemed Hinckley had doubled down on the fact that consumers would understand it, or would have a need for it. When past innovations have just as quickly languished due to designers over-estimating the zeitgeist. How does one measure success with a revolutionary concept? One sold? Two? Twenty? Erin had just finished her turn at the helm. “Now that’s really fun,” she said, beaming. Nearby, there were countless sandbars, pockets of islands, and canals filled with mangroves—all a day trip away—waiting to be explored. It was the end of the day, and we had already logged about 20 miles on board Dasher. 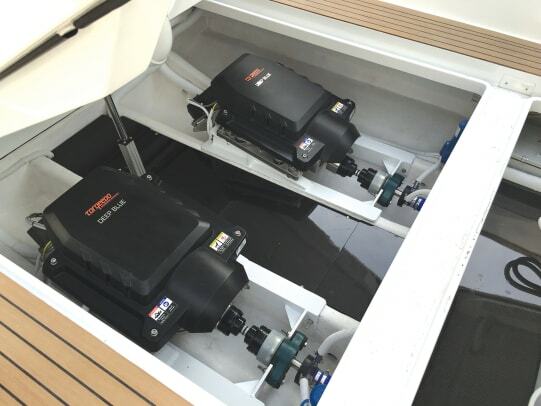 We had even taken a peek at the treasure trove within: its batteries’ prismatic cells running the length of the aft deck, easily accessible by hydraulically actuated risers that opened wide like a drawbridge. A good thing, too, I thought, because the docks will be clambering to get a peek under that hood. Like a game of musical chairs, we had taken turns at the helm. Now, Dan and I hopped off onto a 37 Picnic Boat we had commandeered as a chase boat to take some running shots. As we were passing Dasher, awash in Florida sunshine, I caught a glimpse of Erin sitting in the copilot seat chatting amiably with Scott at the helm. Squinting a little, it wasn’t hard to imagine a succession of couples, each enjoying a picturesque day out on the water, like this one. It wasn’t that hard to imagine. In fact, it was actually really simple. Load: 15 gal. water, 4 persons. Speeds are two-way averages measured w/ B&G GPS display. According to Hinckley: Hull No. 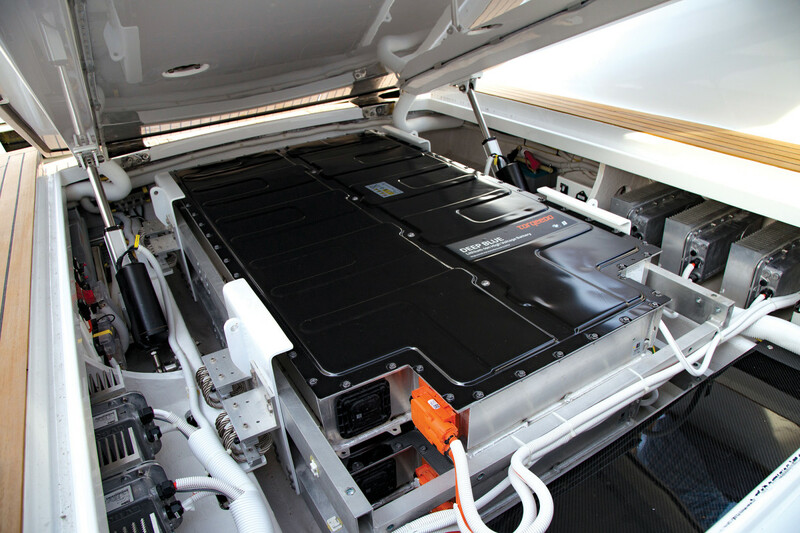 2 will have an enhanced 40 kW battery that will lend it an expanded range of 30 percent.